I don't know much about fashion. Most of the clothes I buy are from Costco, handed over from someone else, or discovered in a Marshall's basement for the low-low price of $19.99 or less. But I do know when something looks really stupid. At least in my own opinion. So, although I admittedly don't "get" some of the latest fashion trends, and I tend to always look like a catalog's idea of what a dad on vacation is, I know stupid when I see it. And these Clear Knee Mom Jeans Nordstrom is selling are definitely stupid. And if you think that's the name that the internet came up to describe how ugly they are, no, that's what these abominations are actually called. My guess is that someone honestly thought that making something ugly and then giving it an ironic name would be a good marketing strategy. The problem is, however, that some stuff you ironically label as "stupid" or "uncool" is still stupid, no matter what. Like you could spend $100 to go and see Jessica Simpson in concert ironically, but the fact is you're still out $100, and you wasted hours of your life. Twitter's angry and baffled by how dumb these friggin' things are. These are actual jeans you can buy at @Nordstrom that cost $95. Called Clear Knee Mom Jeans. People are basically convinced that this is a sign of the end of the world. Apparently people aren't down with showing off their knees through sleeves of plastic attached to denim. There's no way around it, they're an abomination. Others saw the jeans as the perfect way to boost your self-esteem. Others saw them as functional. And someone came up with the perfect shoes to pair them with. Apparently the Clear Knee Mom Jean is just another travesty in a long line of denim atrocities committed by Topshop. Pretty much everyone agrees that they're plain awful. 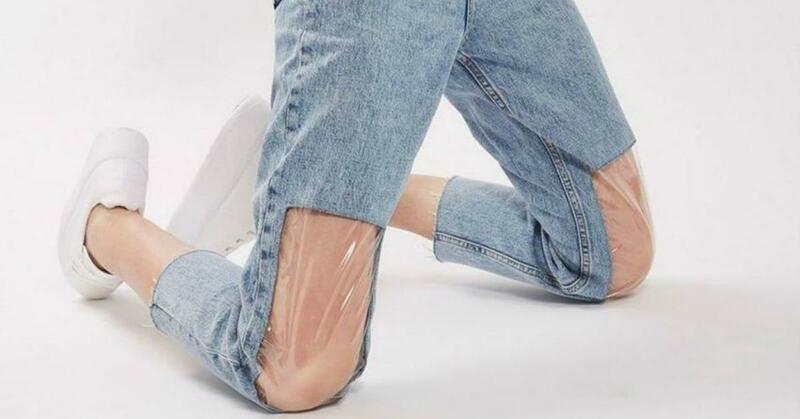 Purpose of those clear knee mom jeans? Someone crafted their own low-cost version of the jeans, too. And I have to say they look just as terrible. But hey, that's just my opinion.